This a nuisance species common around old barns, roadsides, and similar places. The leaves are huge. The brown "cockleburs" are probably the most noticed feature of this Eurasian exotic. They commonly stick to clothing and shoelaces. 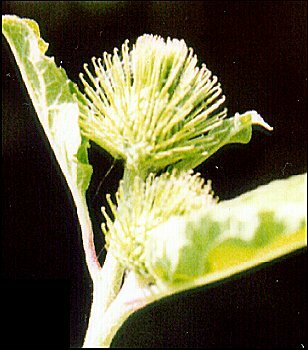 The flowers look like green versions of the brown, round, spiky cockleburs. 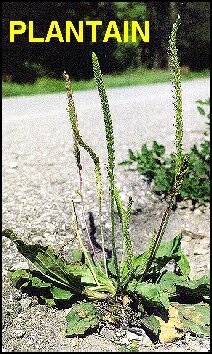 Plantain has small, slender spikes of tight inconspicuous flowers and seeds. The spikes are only several inches long. The leaves are all at the base of the plant. The plant is usually not taller than 6-8 inches. Plantain is one of those plants that most people have seen and recognize, but have never bothered to find out what it was. There are a couple species of plantain common in the U.P., with nine or ten around the state. Some are native and some are exotic. One is on the Michigan endangered species list (P. cordata). What we call plantain is not at all related to the tropical plantain that produces banana-shaped edible fruit. The tall slender, often multi-branched, spikes are what is usually noticed about the docks. When mature, the chocolate-brown spikes loaded with seed are readily seen along roadsides and elsewhere. Flowers and leaves are seldom noticed. The leaves generally grow only at the base of the plant. The species we tend to see along roadways are exotics from Europe, although there are several native species of Rumex, some associated with wetlands. This website was constructed by Bill Cook. If you have questions or comments about the information on this page, contact Bill.